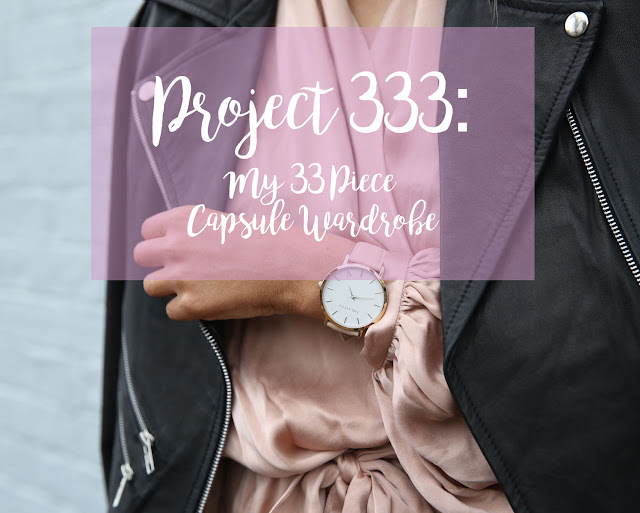 I first heard about Project 333 in The Minimalists' documentary, Minimalism. (It's streaming on Netflix, guys. Go watch it!) Courtney Carver from Be More With Less appears to talk about her MS diagnosis, how it changed her life and how it ultimately drove her to become a minimalist. 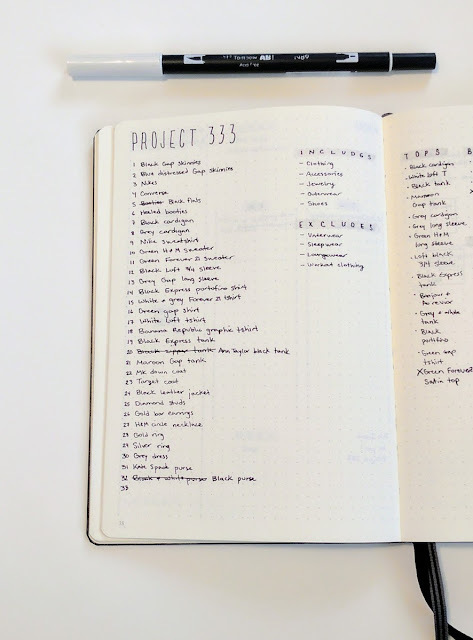 As part of her journey towards minimalism, she created the Project 333 challenge. 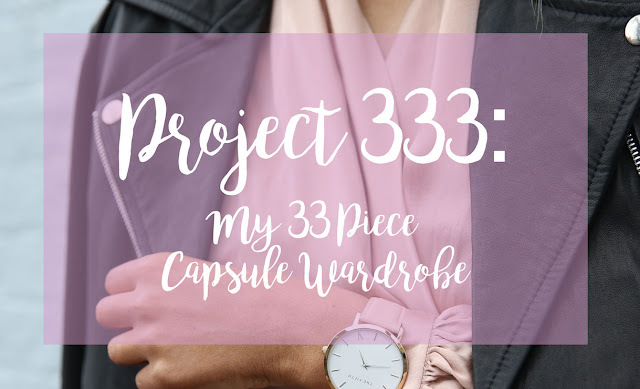 The rules of the Project 333 challenge are simple: wear only 33 items for 3 months. Including shoes, outerwear, accessories and jewelry. As you might have guessed from some of my recent posts, I've been getting more and more into the idea of minimalism. It started with minimizing my Bullet Journal. I simplified that one aspect of my life and suddenly I was realizing how much effort other parts of my life were taking in comparison. While I have never been the tidiest of people, I began to think, hey, maybe that's because I've been fighting an uphill battle against all this stuff. I want to by tidy. I'm making efforts to make things tidy. I just can't keep it tidy. Then, just like practically every other blogger on the internet in 2016, I picked up Marie Kondo's Life Changing Magic of Tidying Up. Suddenly I was paring down everything in my house. Reducing my wardrobe is just another step in this minimalist evolution. Even though my wardrobe is already a lot slimmer than it was before, thanks to the Kon Mari method, I still have plenty to choose from. All these options seem like such a great idea when it's Saturday afternoon and I'm wide awake and playing dress up, but at 6am in the morning when I'm getting ready for work, the last thing I want to do is have to plan an outfit. Having a small wardrobe where everything mixes and matches means there's one less thing for my tired brain to worry about. Once I came up with my final list, it was time to start the challenge! 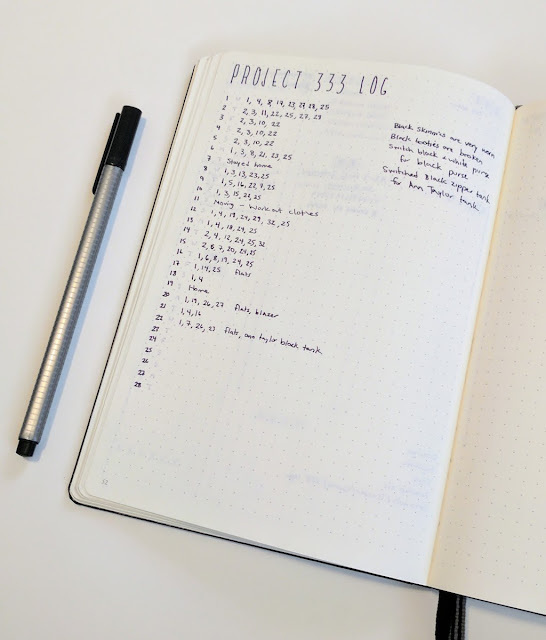 I wanted to get an idea of which pieces was using most along the way, so in true Bullet Journal-er form, I created a tracker. Since my items in my final clothing list were already numbered I just created a single page with a line for each day of the month. On the day's line I just noted the numbers from each item I wore. 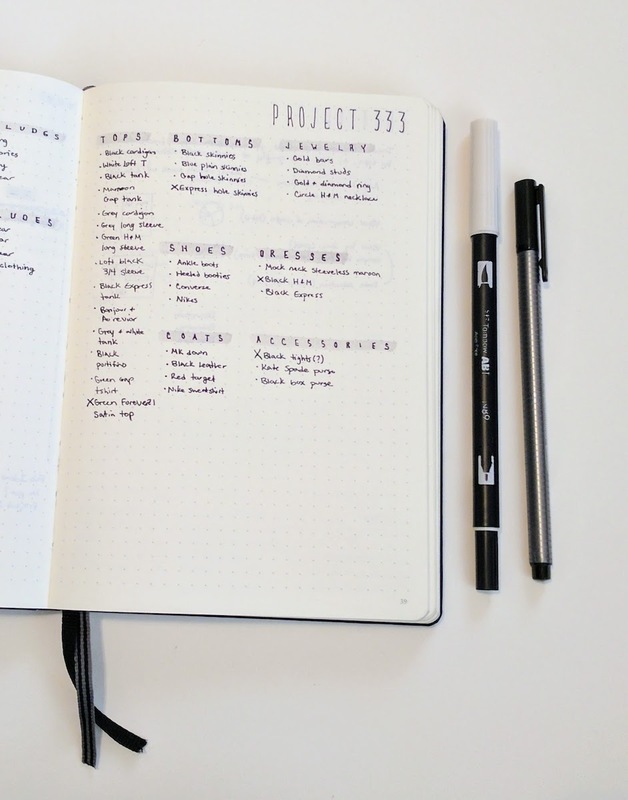 Here's a look at the first month's log. As you can see, I really reached a lot for my black Gap skinny jeans. So much so that I practically wore them out. They were getting pretty worn already but wearing them almost every day really did some damage. You can see that there were actually several things that I either wore down quite a bit or decided I didn't really like after all, and so I switched them out for other items. Getting this kind of information has been really great for knowing which pieces I actually need to replace rather that just mindlessly adding more pieces to my wardrobe when I go shopping. This challenge has also forced me to come to terms with some items I've been hanging on to for a long time, but in reality I just don't like how I feel in them. Adios impossible straps and too-heavy-for-the-fabric zipper tank I've had around for five years. It's finally time to set you free. I started my Project 333 challenge on February 1st, 2017. I'm now wrapping up the third month, and I have to say, this challenge has been quite freeing. Getting ready in the wee hours of the morning has been a breeze, but so has putting together an outfit when going out. I used to take as much time as I could get to get ready before going out and while I definitely don't think there's anything wrong with that (I actually find it to be a sort of self-care/fun time) this newfound quickness has let me get a lot more done (i.e. a longer nap) before it's time to start getting ready, which has been nice! Live with less, choose additions wisely, and love what you have (even if it means doing laundry way more often).